High, High to the north, amidst snow capped mountains and sprawling forests arise from within the holy shrine of Maa Vaishno Devi. Our journey takes you to this awesome wilderness, a place so holy and sacred, a place of mystery and adventure scarcely known to most in modern world. The Yatra begins at Katra and pilgrims cover 13km of terrain on foot to reach the holy Darbar. There is a common faith among the folk that Goddess-Vaishno sends a 'Call' to her devotees : and that once a person receives it, wherever he or she is, marches towards the holy shrine of the great Goddess. Howsoever difficult the passage may be : the difficult ascents, with innumerable stairs, are accomplished on foot by those who had never walked even small distances at their homes. A supernatural power seems to draw them through the mountain and they climb up those great heights step by step, chanting 'Prem se bolo, JAI MATA DI' The Holy Cave Shrine of Maa Vaishno Devi is situated in a beautiful recess of the Holy Trikuta Mountains forming a part of the lower Himalayas as in the State of Jammu and Kashmir. There are images of three deities - The Mahakali, Maa Saraswati and Maha Lakshmi. Copyright 2017. 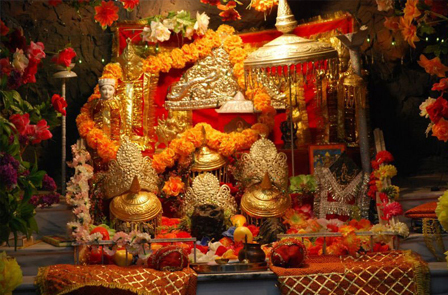 MataVaishnodevi.com. All right reserved Website Designed & Developed by Ideogram Technology Solutions [P] Ltd.